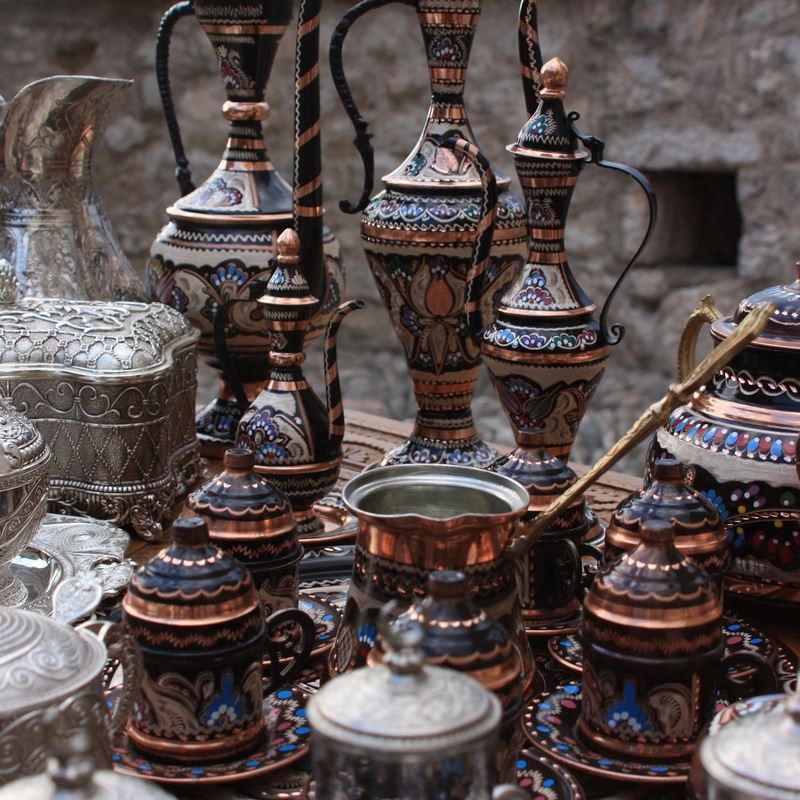 The other day I learned a little about local souvenirs in Mostar. 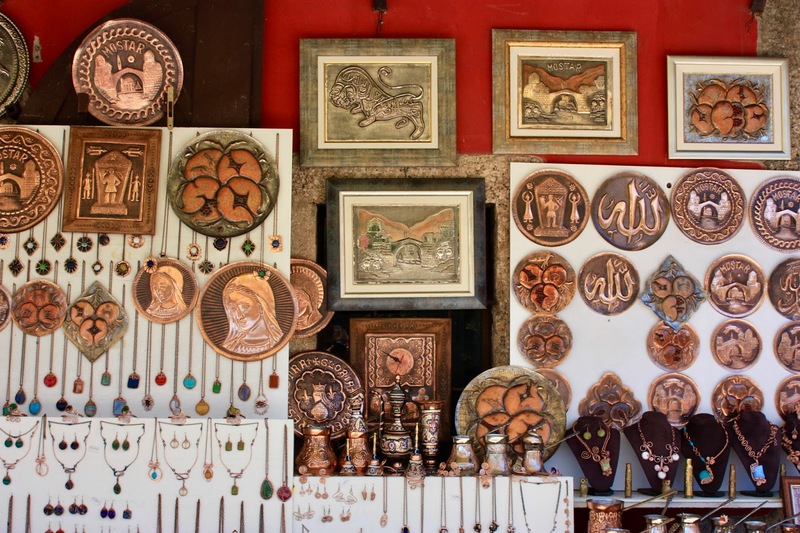 The colorful bronze trays I was originally drawn to are actually Turkish! 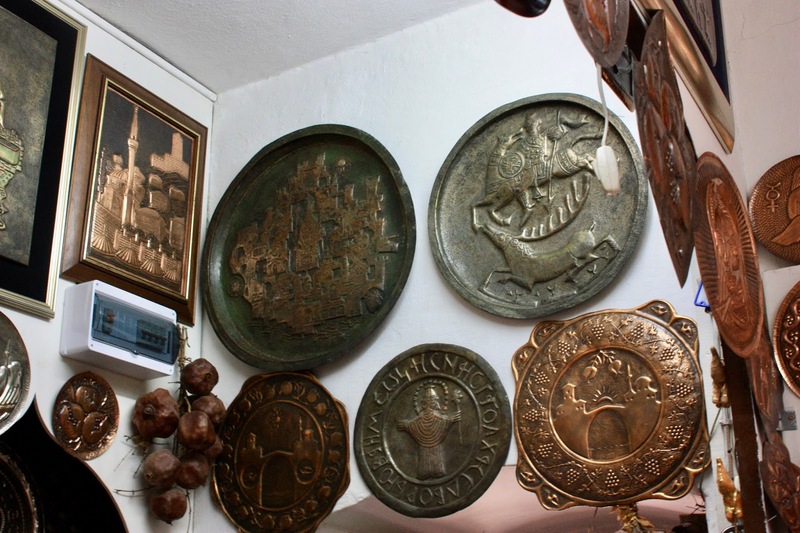 It's the pure bronze (or bronze and tin) etchings that are local. I think I need a good story and tradition to commit to a souvenir. I'd been stopping everywhere to check out the hammered bracelets and coffee cups, totally feeling no commitment to anything. 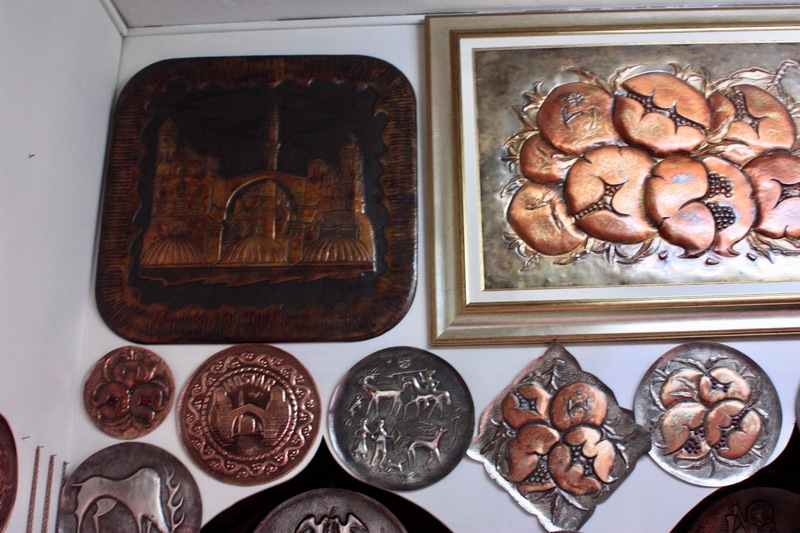 Then a little man stood up from behind his work table, and began pointing out the various designs in his work- symbols from local tombs, the Mostar bridge, faces of ancient coins with Latin lettering, and (my favorite) pomegranates. He brought out a crumbling, falling apart, well-loved book and pointed out a picture from before the war. He pointed at a man in the picture and the Stari Most- "Young man, old bridge," he said. Then he pointed at himself and outside, "Old man, new bridge." It was him in the photo, years before the bridge had been destroyed. His family had been running their workshop since 1918, and he proudly pointed out the badly burned pieces that his family had passed down, pieces that had been burned during various attacks during the war. "Not for sale," he proclaimed. He also showed me a large piece with images from around the city; the bridge, three domes, a minaret, the towers. It was the first he had made once the war was over, and was also not for sale. I love the symbolism of pomegranates from my time in Granada, and they seem to always pop up in various cities. I found one that I loved, and as I paid I asked if I could take his picture at his work table. My heart fell a little when he abruptly told me no, but then he smiled and said that I had to go first, resulting in a few blurry photos of me with his tools. Later that same day, committed to only local, handmade bronze, I passed the cutest man sitting in his teeny shop's doorway with a metal block between his legs, hammering thin pieces of copper. This was actually the second time I had stopped at his shop, so I told him I couldn't walk by without stopping- it was all too pretty! He was so sweet, and told me that if I bought a bracelet I could pick out two rings to have for free. Of course, I went back and picked out a small handful of trinkets to buy- how can you turn down an offer like that!? A couple stopped when they heard his deal, and asked if it applied to all of the bracelets. He responded, "No. Only for her, she's my girlfriend." Sorry gentlemen, I guess that takes me off the market! After making my purchases, I thought about what had drawn me to them after wandering through all those little shops all day without being able to pick anything I wanted to buy. 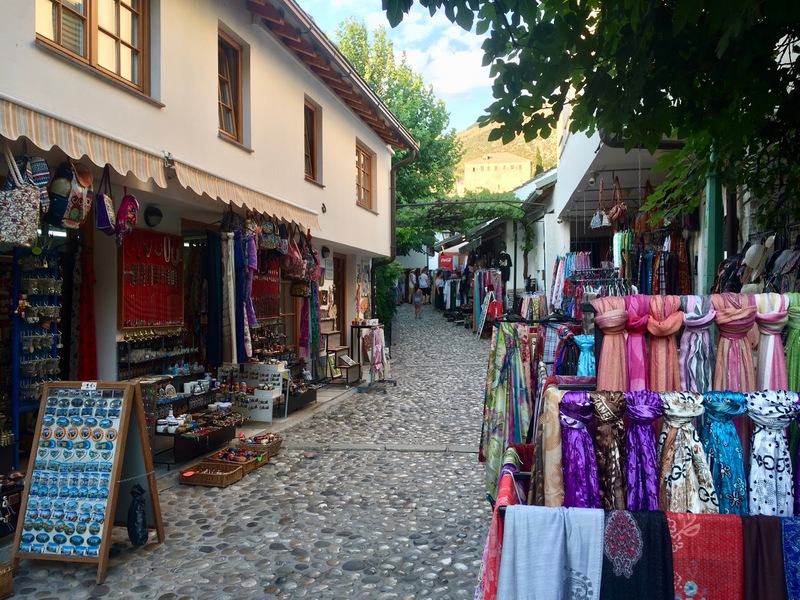 A huge part of it is the local factor; supporting a town's economy by buying local products typical to the area is always ideal, especially when so many shops are overflowing with mass-produced, imported trinkets. 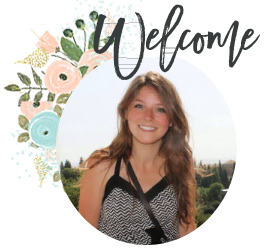 But making a connection with the artisan also plays a part, maybe even bigger. I loved seeing the book that man proudly shared, along with his treasured works his family had crafted over the years. Every time I wear my swirly bronze ring (which I may not have originally picked out), I'll smile and think of my Bosnian boyfriend.